So, you’ve booked your family holiday and the kids can’t wait. But, before you can totally relax, there’s just one small thing in the way: the flight. The prospect of flying with young children is enough to make even the most laidback parents break out in a cold sweat. Getting on a plane suddenly feels like a mammoth task, as you silently wish for angelic children or, failing that, understanding passengers. Thankfully, if you’re flying long haul, you’ll have a selection of in-flight films and TV programmes to keep the kids entertained. But it’s always good to have a back-up plan. To help you out, we’ve got the lowdown on the best ways to keep kids happy on a plane. You’re welcome. Will you have to pay extra to choose your seats? Probably. Is it worth it? Absolutely. Having a window seat is a godsend when flying with kids, particularly if it’s their first time on a plane. Flying is, let’s face it, pretty cool – but when you’re a child, it’s positively mind-blowing. With a window seat, kids can look out at the world below and be nicely distracted during take-off and landing. You could even take things one step further with a game of I Spy. The only catch is, if you’ve got more than one child, there’s bound to be a squabble over who gets the window seat. Simply split the time between them – sharing is caring, after all. Colouring books are great. But you’ll be amazed – and increasingly frustrated – by how many times the pencils will fall on the floor. And how many times you’ll hit your head on the tray table when picking them up. Trust us, sticker books are your new best friend. Little ears do not react well to the changing air pressure. If you’re travelling with toddlers, try giving them a drink in a sippy cup during take-off and landing, this will help relieve the pressure on their ears. 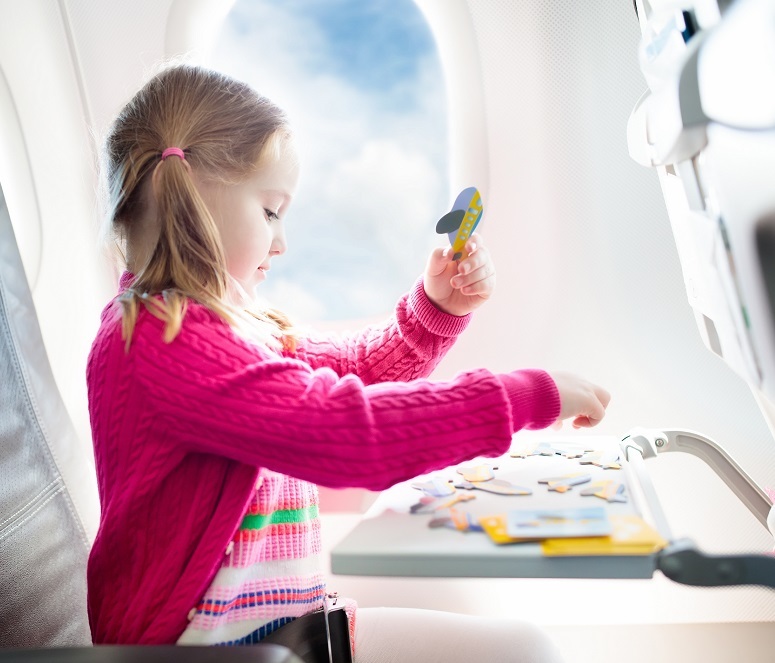 For older children, try lollipops or boiled sweets – although for take-off, you might want to consider sugar-free ones, so the kids aren’t bouncing off the walls for the rest of the flight. You might be used to hearing Peppa Pig on repeat, but your fellow passengers probably aren’t. If you’re planning to let your children play games on your phone or tablet, pack some child-friendly headphones. That way, the kids can still enjoy their game and everyone else can retain their sanity. Let us rephrase: bring as much food as you can physically fit in your bag. Flight meal times may not line up with your usual routine, so it’s best to come armed with snacks. If you’re travelling with some fussy eaters, check out the best airlines for in-flight food. There will come a point when, inevitably, your kids are done with the games, snacks and sticker books, and chaos is on the horizon. This is the moment when you need an ace up your sleeve. Try to keep something back that your children don’t know about, whether it’s a much-loved toy or a new activity. Then, when you produce this surprise, the kids will be entertained for just that little bit longer. Increasingly, airlines are allowing children to meet the captain either at the start or end of the journey. Some airlines even let kids go into the cockpit, where they’ll be amazed by the million buttons and levers. Find out if this is something your airline offers, or speak to the cabin crew to see if it’s possible. Even if this isn’t an option, some airlines hand out plane-themed activity packs or pilot caps, so it’s always worth asking. Find cheap flights for your next getaway, or check out our top tips for saving money on your family holiday. Thinking of flying long haul? Read about how you can avoid jet lag.